To get SEO optimized site, submitting sitemap is compulsory. To get User Frienly site, creating a stylish and good looking table of contents is one of the Answer. No question about it, if you have your sitemap submitted to google for instance, google has a better idea to learn your site structure. And if you list your posts in a table of contents page, your visitors will be able to see all posts and choose what interest them. To submit sitemap please read how to generate sitemap for better page indexing, and to create table of contents please continue reading this post. Replace "yourblogname" with your real blog URL, save the post and done. For live example of how this table of contents looks like, click the sitemap links in the main navigation menu or click here. Additionally, you may change the look of your TOC by editing the included style above. 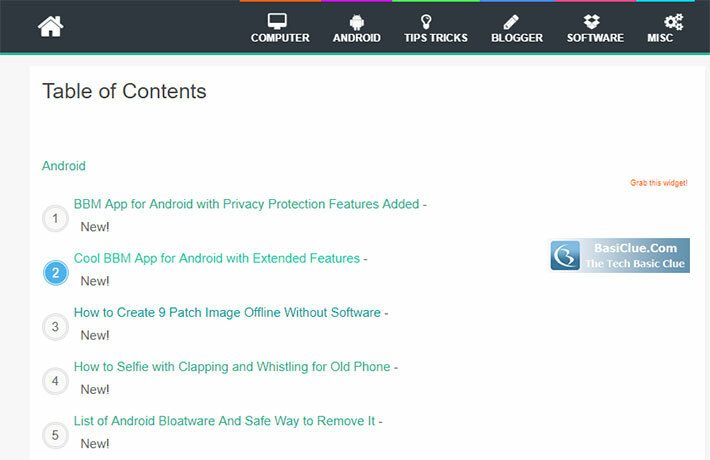 There you may change the Border, Label Color and Background, Latest Post Info, and Post Title list style. Just edit and customize the style whatever you like so it should match your site template. Note, the special linear gradient CSS applied. For some browser like old Opera, this linear gradient will not work. But it should work fine in latest modern browser like Google Chrome, Mozilla Firefox or Safari.